Hi Friends: There is a new challenge today over at the Stinkin' Inkers Challenges Blog, where the current theme is It's Spring. 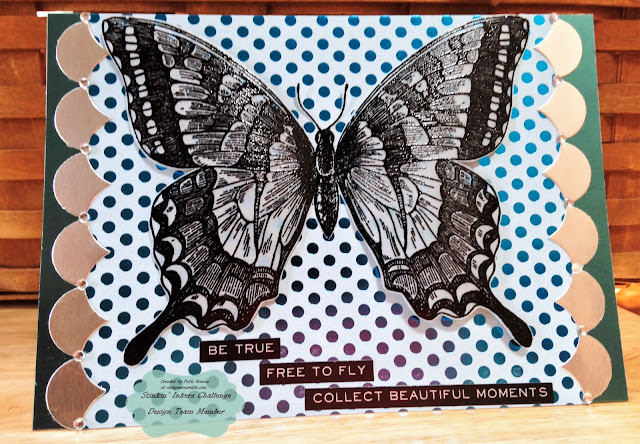 When I think of spring, I think of flowers blooming and lovely butterflies gliding around them, so I chose to do a simple card with one of my favorite butterfly images, the Swallowtail stamp from Stampin' Up! Stamp butterfly image onto vellum with Versamark ink, heat emboss with fine detail black embossing powder, and fussy cut. Cut foiled papers to fit A7 card base and glue to card. Use Striped Scallop die to cut the scallops from silver foiled paper - use only the cut-out pieces to edge the seam on both sides of the card border. Add gems where the scallops meet. Glue the body of the butterfly to the card, then use foam squares to lift the wings. Finish with sentiments from the Tim Holtz Quotations pack.